Icelandic protest: bicycle shop "Jews are not welcome"
"To protest against the Israeli operation in Gaza and show solidarity with Hamas, a bicycle shop in Reykjavik, capital of Iceland shows a poster reading "Jews are not welcome". According to an Icelandic source, the word used 'Judar' has a negative tone in the local language whereas 'Gyndingur' is the correct neutral word." "Around 30 people are currently protesting outside the Icelandic parliament building. The protesters are angry that Iceland has not been outspoken in its criticism of Israel’s current military operations in the Gaza Strip, according to MBL.is. The group is now outside parliament, but originally met this morning on the lawn of the Prime Minister’s office. Police are following the protesters, but have not yet done anything to intervene. Some of the protesters are lying on the front steps of parliament, meaning police may see fit to move them should access to the building be significantly impeded." "A group of ten to 15 protesters, mostly wearing masks, gathered outside the Icelandic Foreign Ministry on Friday afternoon and pelted the building with balloons filled with red paint. The protesters aim was to turn the building red in protest at Iceland’s continued political relations with Israel. According to a statement from the group, Iceland should immediately halt diplomatic relations with Tel Aviv in protest at the bloodshed currently taking place in the Gaza Strip. Police surrounded the building quickly, but the protesters disbursed peacefully and nobody was arrested. Reykjavik also participated in yesterday’s Europe-wide series of protests against the current Israeli operation in Gaza." "The Spanish example of "lawfare" was initiated by the Palestinian Center for Human Rights (PCHR). With a large budget provided by the European Commission, Norway, Ireland, Sweden, Switzerland and other European governments, PCHR is among the leaders of the anti-Israel demonization strategy." Typically, Europe is the undisputed "leader" in the demonization of Israel. "The case in Spain against Israeli officials, which stems from the 2002 air force attack that destroyed the home of a senior Hamas terrorist and killed several of his children, is based on the universal jurisdiction provisions in the legal systems of a number of democratic countries. While designed to bring heinous dictators to justice, "lawfare" - as this tactic has been dubbed - is exploited by non-governmental organizations that use the façade of universal human rights to promote their political goals. The pattern emerged in 2001 when Human Rights Watch, Amnesty International, Badil (which focuses on refugee claims) and other NGOs used Belgium as the venue for allegations of war crimes against then-prime minister Ariel Sharon. The case was eventually dismissed and the law changed after Belgian officials linked to African dictators realized that they, too, were vulnerable to prosecution. In 2005, Maj.-Gen. (res.) Doron Almog, who had retired from the IDF and was traveling to London to raise funds for the treatment of autism, stayed on an El Al plane at Heathrow Airport after NGOs targeted him with legal proceedings. This case, too, was later dropped, but the damage had been done. The Spanish example of "lawfare" was initiated by the Palestinian Center for Human Rights (PCHR). With a large budget provided by the European Commission, Norway, Ireland, Sweden, Switzerland and other European governments, PCHR is among the leaders of the anti-Israel demonization strategy. The strategy was developed in the NGO Forum of the 2001 Durban Conference, the goal being to use boycotts and legal processes to brand Israel an "apartheid" state, while legitimizing terrorism. During the recent Gaza operation, PCHR issued over 50 statements, most of which included allegations of "war crimes." In contrast, top Israeli government figures have been very slow to recognize these threats and devise a counter-strategy. While "lawfare" has been around for a number of years and PCHR filed its request with Spanish authorities in June, it has failed to register in the IDF and elsewhere. After the Gaza operation, Prime Minister Ehud Olmert pledged to provide legal support for officials caught up in the harassment - a belated and irrelevant approach. In response to the developments in Spain, Defense Minister Ehud Barak reacted angrily and Pubic Security Minister Avi Dichter expressed hope "that common sense will prevail" among Europeans. Somewhat more concretely, the Foreign Ministry has pressed European governments to amend their legal codes to prevent NGOs from bringing such cases to court, but scant attention has been paid in Israel to EU and government funding for PCHR. There has been no cost to European officials, such as the Spanish prime minister, who are still welcomed by Israel as peace mediators. After the surprise attack delivered by the Spanish court, the Israeli government will have to give much higher priority to preventing "lawfare" cases before ministers and IDF officers are met by police in the arrivals hall and taken for interrogation." "Jensen was calling for the same things as Barack Obama. The difference is that she was doing it in Norway. The environment here is different." That's according to Dr. Asle Toje, a researcher at the BI Norwegian School of Management and foreign policy adviser to the Progress Party of Norway (Fremskrittspartiet). The Socialist Left Party (Sosialistisk Venstreparti), which is part of the current coalition, has proposed a number of boycotts against Israel since the government was formed in 2005. "The first was a general boycott," said Toje. "Next came an academic boycott and then a boycott on arms." The boycotts, though not implemented, have exacerbated an already hostile atmosphere. Israeli/Nazi comparisons and anti-Semitic incidents are now commonplace, Toje said. On January 21, Etgar Lefkovits reported in The Jerusalem Post on an e-mail sent out by Trine Lilleng, a senior Norwegian diplomat based in Saudi Arabia. "The grandchildren of Holocaust survivors from World War II are doing to the Palestinians exactly what was done to them by Nazi Germany," Lilleng wrote. Foreign Minister Jonas Gahr Støre (Labor), in his recent memoir, "To Make a Difference", makes an implicit comparison, noting, when writing of Hebron: "Most of the shops have been shut down. The shudders have been bolted and are marked by signs from the Israeli police. They are marked, as other shops have been marked at other places and at other times." In August 2006, Jostein Gaardner, an esteemed Norwegian author and a friend of Støre's, published an op-ed in the Aftenposten daily under the headline, "God's chosen people." Gardner wrote, in reaction to the Second Lebanon War, "We don't believe in the notion of God's chosen people. We laugh at this people's capriciousness and weep at its misdeeds. To act as God's chosen people is not only stupid and arrogant, but a crime against humanity. We call it racism." A week later, Gaarder penned another op-ed, expressing his "regret if I have hurt anyone - though I intended and still intend to be harsh in my critique of the State of Israel." In September 2006, 10 shots were fired at an Oslo synagogue, but no one was hurt. The shooter, Arfan Bhatti, "wished to kill women and children coming out of the synagogue,"Aftenposten reported. On June 2, 2008, Bhatti was acquitted of terrorism charges and convicted of "aggravated vandalism." He is now serving an eight-year prison sentence. Norway's approximately 1,500 Jews, who live mainly in Oslo and Trondheim, have experienced a fair amount of anti-Semitism, Toje said. He posited that this was connected with the mass immigration from Muslim countries that began in the 1970s. On Israel, he said, "An unwillingness to see that there are two sides to the story has emerged. The far left has invited radical Islam into bed with them. It is the new thing to be apologist about." In defying that trend, Toje praised Jensen as "a very bold politician. She stood up and made her voice heard at a time when it was not the popular thing to do - which is usually when it really matters." "For eight years we were made to believe in all the deceptions by George Bush and his clique and in the shameful Wall Street dealings. We are now being made to believe that Barack Obama is the saviour of the superpower and that he will save the world. It is normal that each group seeks to attract the President to its own camp and there is no doubt that those who wield little power elected Obama. But it will be the most powerful who, to the benefit of the virtuality of the market economy and its dynamism, will divert Obama's attention away from the poorest peoples in the Americas, Africa and Palestine. Israel has already done enough to show that even with Madoff the Pharisee in jail, the U.S. will continue to have faith in Israel, in spite of having committed all manner of crimes against humanity." All the obscene anti-Semitic ingredients are here: Jews (the most powerful), personified by Madoff the Pharisee and Israel, are such power grabbers and selfish cheats that they are responsible for all the ills and poverty in the world. At least Frei Bento Domingues is frank about his antipathy for Jews, and doesn't hide behind sophisticated arguments to hide the fact. making it rise out of deserts." Jerusalem, beside the waters of Babylon. but with the hard work, beleaguered land. and to which you must not look back in yearning. and learn the tongue of Paradise. making it rise out of deserts. will work by your side. your place in the battle. es también la más joven. sino con el rigor, tierra última. Olvidarás al otro que dejaste. y a las que no darás tu nostalgia. Olvidarás la lengua de tus padres y aprenderás la lengua del Paraíso. Serás un israelí, serás un soldado. Edificarás la patria con ciénagas: la levantarás con desiertos. Trabajará contigo tu hermano, cuya cara no has visto nunca. tu puesto en la batalla. "German prosecutors said Friday they had launched a probe against a controversial British bishop on suspicion of inciting racial hatred for comments he made about the Holocaust on Swedish television. A spokesman for the public prosecutor's office in the southern city of Regensburg said it had opened an investigation against Richard Williamson, 68, for remarks he made in an interview broadcast this week. "I believe there were no gas chambers... I think that 200,000 to 300,000 Jews perished in Nazi concentration camps but none of them by gas chambers," said Williamson during an interview with the SVT channel. Six million Jews [includin 1.5 million children] were murdered by Nazi Germany during World War II including vast numbers by systematic extermination in gas chambers. 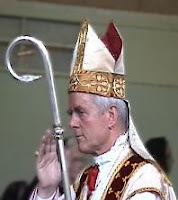 This week, Pope Benedict XVI reportedly decided to cancel the excommunication of four bishops who were consecrated in 1998 by the conservative French bishop Marcel Lefebvre, including Williamson. The pope has already signed the decree lifting the excommunication, which will be made public later in the week, according to the Italian report Thursday which the Vatican neither confirmed nor denied. 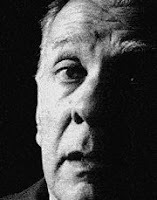 Lefebvre, who died in 1991, was excommunicated in 1988 by pope Jean Paul II for having consecrated the bishops in defiance of the Vatican's authority. Since assuming office in April 2005, Benedict has made great efforts to heal the schism with the more traditionalist Catholic movement. Lars-Goran Svensson, the Swedish programme's producer, said the interview had been pre-recorded in Germany last November and its airing at this time was "pure coincidence."" "Holocaust survivors have no need for moments of silence for dead Jews from people who have no respect for live Jews." 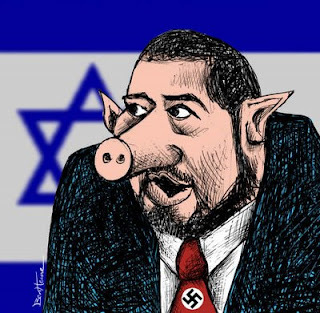 "The Simon Wiesenthal Center denounced the government of the Spain’s Catalunya region for cancelling its public commemoration of International Holocaust Day on January 27th as a way to protest Israel’s operations in Gaza. An official from the city of Barcelona, where they memorial was to be held, was quoted as saying, "Marking the Jewish Holocaust while a Palestinian holocaust is taking place is not right." "The Wiesenthal Center denounces this perverted inversion of truth and memory by officials in Barcelona. Holocaust survivors have no need for moments of silence for dead Jews from people who have no respect for live Jews," said Rabbi Abraham Cooper, associate dean of the Center. "In dealing a telling blow against Hamas in Gaza, Israel ensures that the terrorist organization's open goal of making the Holy Land 'Judenrein' (free of Jews) will never happen," he added. "The Catalunya government would do well to learn the moral difference between a terrorist group targeting civilians who protected themselves by using their women and children as human shields and a member state of the United Nations doing what any government, including Spain would do: eliminate such a threat against her civilian population. Israel should be rightfully proud of the extraordinary steps her military took to minimize casualties among civilians, cynically put in harm’s way by Hamas," Cooper concluded." Anti-Israel protesters routinely shout "We are all Hamas"
"The recent Gaza operation left many well-meaning foreigners baffled by one question. As New York Times correspondent Ethan Bronner put it: "How can a war that looks so awful... be supported by such a vast Israeli public?" Bronner's article offered some correct answers: Hamas' deliberate u se of human shields, which makes civilian casualties inevitable; our conviction that our army nevertheless strives to avoid such casualties; Hamas' commitment to our destruction. However, there is also another factor. It is often termed "double standards," but goes considerably deeper than that. Consider a few examples: "Hamas, Hamas, Jews to the gas!" was the slogan shouted at a Dutch rally against the Gaza war last week. Similarly offensive slogans were shouted at rallies in other countries, which collectively drew hundreds of thousands of protesters. Many Israelis have asked where all these protesters were while 6,000 Hamas mortar shells and rockets pounded the South over the last three years. But that is actually the wrong question. Hundreds of thousands worldwide also protested America's wars in Iraq and Afghanistan, yet would never have dreamed of protesting against Saddam Hussein or the Taliban. There is a known double standard among some Westerners whereby only Western actions merit condemnation, while non-Western thugs get a pass. This is outrageous and sh ould be fought, but it is not unique to Israel. No anti-American demonstration, however, ever featured protesters shouting "Americans to the gas!" Nor did anti-American demonstrators shout "we are all al-Qaida," thereby implying support for the 9/11 attacks - whereas anti-Israel protesters routinely shout "we are all Hamas," thereby expressing support for suicide bombings, shootings and rocket launchings that have killed hundreds of civilians. Hence the underlying message of these demonstrations is not "we object to killing Palestinians," but rather "we support killing Jews." Worse, that message is not socially unacceptable: If it were, hundreds of thousands would not attend rallies where such slogans are chanted; these would be fringe affairs attracting a few dozen people at most. Other examples abound - like the fact that most of the countries condemning us have killed far more civilians in their own wars than Israel ever has. Or that none of the people who keep proclaiming that this country may defend its citizens, "but not like that," has ever suggested any potentially effective measure that they would consider justified. The bottom line, however, is this: We can support a war that looks awful to others because we start from different premises - that killing Jews is unacceptable, and this country has an obligation to prevent it; that we are entitled to use the same methods of self-defense as other countries; that international law must apply either to both sides or to neither; and that not every Palestinian accusation parroted by aid workers or journalists is necessarily true. Granted, our critics claim to accept these premises as well. But their actions, as detailed above, speak far louder than words." 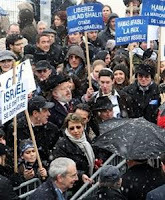 Photos: Brussels, January11, 2009, anti-Israel demonstration: both placards nazify Israel. One reads: "Gaza = Dachaus", the other "Tzipi Livni, Hitler's Wife"
"Since when are European Muslims a weapon? Threatening that European Muslims will use violence to get their wishes is a very dangerous double edged sword. Unless they want to be seen and treated as a foreign weapon, it is a threat that European Muslims should strongly reject. A couple of warnings from the Palestinians. First, from the PLO representative in the EU, Leila Shahid [strangely enough Ms. Leila Shahid is ... the grand-niece of Hajj Amin al Husseini, the Grand Mufti of Jerusalem*, and a niece of Yassir Arafat], regarding the compromise resolution accepted by the EU in Strasbourg. Shahid was concerned that the statement did not mention article 2 of the Euro-Mediterranean agreement with Israel, which states the relations between the two will be based on respect for human rights. "A watered down text feeds the violence of the citizens of Arab origins living in Europe. They have the impression that the same rules don't apply to everybody when it comes to human rights." This is not the first time that Shahid uses the Muslim citizens of Europe as a threat. Mr Nassar warned that Europe's Muslim population would not forget the EU's lack of hard action. "The European position through this was not good and effectively supported the Zionists," he said. "They should understand that Europe will be the first to get damaged by the Islamic movements there. Revolutions always arise out of injustice." Now the Arabs see Europe as raising empty slogans while doing nothing on the ground. If these massacres had been done against animals Europe would have been upset about animal rights. When it is Arabs or Muslims being killed no one does anything." See also: Leila Shahid on the war in Gaza"
Fantastic good news/fantastic progress : a German court prohibits calls to murder Israelis (Jews ?) at the demonstrations. But allows use pro-Hamas paraphernalia and "Jewish pigs" insults. "A court in the German capital struck down an administrative ban on Hamas flags, clothing and banners on Friday, but left in place the ban on invoking Hamas Foreign Minister Mahmoud Zahar's call to murder Israeli children worldwide. The decision paved the way for supporters of the Islamist movement to march in anti-Israeli rallies on Saturday with pro-Hamas paraphernalia. The German Peace Council and the Palestinian community in Berlin prevailed in their effort to revoke the administrative order issued by Ehrhart Körting, the Social Democratic Party commissioner for security in Berlin, that banned use of Hamas flags. However, the court prohibited calls to murder Israelis at the demonstrations. Körting told the Berlin Morgenpost daily "that because of their terrorist attacks, and especially their constant rocket attacks on Israeli citizens, Hamas has been on the European Union's list of terrorist organizations since September 2003. Support for Hamas in Germany through demonstrations justifies the rocket attacks on Israel and encourages Hamas to undertake further rocket attacks." Körting added that if a court permits support for "verifiably anti-constitutional and anti-Semitic organizations" due to freedom of speech protections, other ways must be found to restrict pro-Hamas activity. Anti-Israeli demonstrations across Germany have been marked by calls to "kill, kill Israelis" and "kill, kill Jews", as well as "Jews out" of Germany and Israel. A political commentator in the Kölner Stadt-Anzeiger wrote a column titled "About looking away and forgetting" that "blatant anti-Semitism is blossoming. Germany is currently experiencing perhaps the largest anti-Jewish manifestations since World War II. 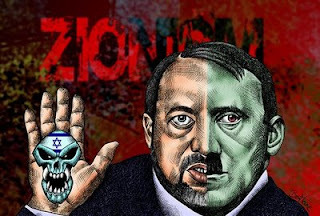 Jews are called child-murderers, and Israel is compared with the Third Reich." A handful of critics have bemoaned German political and societal indifference to the widespread loathing of the Jewish state at the mass demonstrations in German cities. In Kassel, in Hesse state, protesters were greeted by cheers as they attacked a solidarity stand for Israel and attempted to tear down Israeli flags and banners on Saturday. Police departments in Duisburg and Düsseldorf banned Israeli flags and pro-Israeli solidarity activity at rallies over the last two weeks. In Mainz, people waving Israeli flags at an angry pro-Palestinian demonstration over a week ago were forced to seek refuge in the Kaufhof department store. Aggressive protesters screamed "Jewish pigs" and motioned toward the Israel supporters who found shelter in Kaufhof. According to the pro-Israeli activists, consumers in Kaufhof said, "We do not need people like you here." Kai Süssenbach, a police spokesman in Mainz, told a local television station that "a group of people were provokingly waving Israeli flags." Süssenbach added that since the activists were not Israelis, it could be assumed they were provocateurs. The Kaufhof department store issued an order banning the pro-Israeli group from the store's premises. Ironically, the Nazis stripped the Jewish owner of Kaufhof, Leonhard Tietz, of his property in 1933 and "aryanized" the store." "By avoiding a one-sided position, the European Parliament resolution enables the EU to remain a key interlocutor in the political dialogue that the EJC hopes will resume between Israel and Hamas." "The European Jewish Congress (EJC) said a resolution on the Gaza conflict adopted by the European Parliament on Thursday is “balanced” and "identifies with the suffering of civilian populations on both sides of the conflict." The EU parliament resolution, voted by a large majority of MEPs during the plenary session in Strasbourg, calls for an "immediate and permanent ceasefire" in the Gaza strip. It also calls on Hamas "to end rocket attacks and to assume its own responsibilities by committing itself to a political process aimed at restoring inter-Palestinian dialogue and contributing to the ongoing process of negotiation." "By avoiding a one-sided position, the European Parliament resolution enables the EU to remain a key interlocutor in the political dialogue that the EJC hopes will resume between Israel and Hamas," the European Jewish Congress said in statement. Based in Paris, the EJC is a political umbrella organization that represents 42 European Jewish communities. The EJC said it has been actively lobbying in Strasbourg for a parliamentary resolution that takes into account Hamas’ provocations and rocket attacks on Israeli civilians. The EJC also urged the European institutions, in particular the EU Parliament, to pass a separate resolution that openly condemns the recent wave of anti-Semitic attacks that have been taking place throughout Europe. "European authorities have a responsibility to speak out against the alarming recrudescence of anti-Semitism and condemn all anti-Semitic acts of violence and vandalism," the Jewish group said. " "Bruno Stevens, is fully occupied in Gaza. He’s the only journalist who can get in despite the fact that the Jews [sic] tried to hide the truth by blocking the journalists. [Note, no comment about why the Egyptians have blocked them.] His first messages and photos can be seen in HNB. Soon also in NW, PM, and Stern!!" and "knows" everything about Al Dura, just everything. I am ashamed that such a man has my nationality." I’ve discussed Bruno’s work and his analysis in the Lebanon War, also available in French. Keep an eye for his photos." The mythical Arab Street now reaches deep into Paris, London, Berlin and Madrid. "Give Giancarlo Desiderati credit for his unintellectual honesty. While most left-wing detractors of Israel claim their animosity toward the Jewish state has nothing to do with anti-Semitism, the head of a small Italian union, Flaica-Uniti-Cub, wasted no time with such sophism. Having long called for a boycott of Israeli goods, Mr. Desiderati last week made the logical next step. "Do not buy anything from businesses run by the Jewish community," his group's Web site urged Italians. At rallies in Germany and the Netherlands over the past two weeks, protesters shouted, "Hamas, Hamas, Jews to the Gas." In Amsterdam, Socialist lawmaker Harry van Bommel and Greta Duisenberg, widow of the first European Central Bank president, marched at the front of one such "peace" demonstration. They didn't join in the background chorus calling for another Holocaust. Instead, they chanted, "Intifada, Intifada, Free Palestine." Mr. Van Bommel later insisted this wasn't a call for Jewish blood but for "civil disobedience" -- a laughable defense given that terrorists during the last intifada murdered more than 1,000 Israelis. After a burning car was rammed into a gate outside a synagogue in Toulouse last week, President Nicolas Sarkozy issued a statement that was as morally confused as his judgment of Israel's Gaza offensive. Mr. Sarkozy, who condemned both Hamas terror and Israel's attempt to stop it, also blurred the distinction between the victims and perpetrators of anti-Semitism in France. His country "will not tolerate international tensions mutating into intercommunity violence," he warned, suggesting that the violence in France comes not only from French Muslims but Jews as well. Mr. Sarkozy's comments also suggest that the fighting in Gaza is the cause for attacks on Jews in France -- that is, that the Mideast conflict is fueling anti-Semitism in Europe. It is exactly the other way around. The rage against the Jews that is exploding in Europe has been carefully nurtured; it is not spontaneous sympathy for fellow Muslims in Gaza. How else to explain the silence when Muslims in other conflicts, from Darfur to Chechnya, are being killed? Hamas and other Islamists continue what the Mufti had helped to start: a blend of European anti-Semitism and Islam-inspired Jew hatred. The rejection of Israel's right to exist is what drives their attacks. The media, though, largely ignores Hamas's ideology and its crimes of hiding its leaders and weapons among its own civilian population, and demonizes Israel's attempt to protect its citizens. Hamas and other Islamists are not even trying to hide their ideology. Just read the Hamas charter or check out Hamas TV, including children's programs, for a nauseating dose of murderous anti-Semitism. Last week, the French broadcasting authorities banned Hamas TV for inciting violence and hatred. Unfortunately, just like Hezbollah TV, which is also banned in Europe for its anti-Semitic and jihadi content, audiences here can still receive these programs due to Saudi Arabia's Arabsat and Egyptian satellite provider Nilesat. The Islamist variation of Jew hatred is now being reimported to Europe. Muslims in Europe, watching Hamas and Hezbollah TV with their satellite dishes, are being fed the same diet of anti-Semitism and jihadi ideology that Palestinians and much of the Middle East consume. This brings a unique challenge to the difficult integration of Muslims in Europe. When it comes to issues like Shariah law and terrorism, one can expect a true "clash of civilizations." There is no Western tradition that would justify "honor killings." Anti-Semitism, on the other hand, is not alien to Europe's culture -- to the contrary, the Continent once excelled at it and many still share the feeling. A Pew study from September shows 25% of Germans and 20% of French are still affected by this virus. In Spain, 46% have unfavorable views of Jews. Is there really no connection between this statistic and the fact that the Spanish media and government are among Europe's most hostile toward the Jewish state? Is it just a coincidence that Europe's largest anti-Israel demonstration took place Sunday in Spain, with more than 100,000 protesters? A 2006 study in the Journal of Conflict Resolution based on the survey in 10 European countries suggests otherwise. Yale University's Edward H. Kaplan and Charles A. Small found "that anti-Israel sentiment consistently predicts the probability that an individual is anti-Semitic, with the likelihood of measured anti-Semitism increasing with the extent of anti-Israel sentiment observed." With little hope that the media coverage will become more balanced and the incitement of the growing Muslim community will abate, the Jews in Europe are facing uncertain times." Daniel Schwammenthal edits the State of the Union column in the Wall Street Journal. This article appeared first in the Wall Street Journal Europe. - From the start of the demonstration, dozens of children were grouped at the head of the march, surrounded by adults and forced to repeat slogans that it was obvious some of them did not understand. - Certain children carried banners or placards containing explicit calls to hatred, while others waved flags of terrorist organizations such as the Hezbollah. - A group of children was allowed by the supervisors to set fire to an Israeli flag and then to trample on it to the cries of "Allahu Akhbar". - At the end of the demonstration, the children were made to lie on the ground to perform a macabre "die in" meant to symbolize the children victims of Gaza. The ESISC questions the compatibility of this manipulation of children with articles 19 and 29 (paragraphs B and C) of the International Convention on the Rights of the Child and more generally, with the values of a democracy such as Belgium." "A group of children with t-shirts and hands painted to look bloody went first in the demonstration procession from the Parliament to Israel's embassy yesterday. This was, among other things, to help prevent the demonstration from becoming violent, according to the organizers. When the demonstrators got to the embassy the children were first in line and called out slogans, while the other were held back by the organizer's own guards. "Al-Aqsa TV is notorious for its incitement to antisemitism, demonstrated in a speech last week by senior Hamas official, Mahmoud al-Zahrar, who claimed that the Israeli operation in Gaza justifies Muslims murdering Jewish children worldwide," the Simon Wiesenthal Centre complained in a letter to French regulators. "Hamas's television channel was taken off the air in Europe less than 24 hours after it was added to a satellite network, industry officials said Friday. Hamas announced on Monday that Europeans would be able to see its Al-Aqsa service -- best known in the Middle East for its virulent anti-Israeli content -- via the French firm Eutelsat's satellites. Al-Aqsa is Hamas' official mouthpiece, and became notorious outside the Palestinian territories for a show in which a man-sized pink rabbit named Assud urged children to embrace martyrdom and threatened to eat Jews. Alerted by industry sources, the ‘Higher Audiovisual Council’ (CSA), the French broadcasting regulator, this week wrote to Eutelsat and warned that much of Hamas' programming contravenes laws against inciting hatred and violence, the government body said. A Eutelsat official said the company had never had a contract with Hamas but that it had rented space on one of its satellites to Noorsat, a Bahrein-based provider, which had in turn begun showing Al-Aqsa. Noorsat was warned to respect French law, and the broadcast has halted. “Al-Aqsa TV is notorious for its incitement to antisemitism, demonstrated in a speech last week by senior Hamas official, Mahmoud al-Zahrar, who claimed that the Israeli operation in Gaza justifies Muslims murdering Jewish children worldwide,” the Simon Wiesenthal Centre complained in a letter to French regulators. The group worried that Arabic-speaking Europeans could "be exposed to Jihadist calls for attacks on their Jewish neighbours and to revulsion for European values of secularism, multiculturalism and tolerance." In May 2005, France's highest judicial body the Council of State ordered Eutelsat to halt re-broadcasting of the Lebanese Hezbollah militia's Al-Manar station because of the anti-Semitic content of its programming. The Wiesenthal Centre expressed the hope that Muslim leaders across Europe will join this appeal to protect their youth from the Hamas' Al-Aqsa channel of hate." The website of the viciously anti-Semitic European Arab League (AEL) - based in Belgium - has finally been suspended (for how long?). The AEL a front organisation for the Hezbollah in Europe. "Principal Olav Nielsen has become a hot name in Palestinian circles. His remarks to the Fyens Stiftstidende newspaper that he would advise Jewish parents against sending their children to Humleh'aven school were extensively discussed. "It's caused disquiet among the Palestinians all over Denmark. We are perturbed about such a statement from one who worked with children for many years," says Monzer Dodar. He's a Danish-Palestinian, chairman of the anti-discrimination association IDFAD's branch in Fyn (Funen), was a founder of the 'father's group' and resident group in Odense and works as an educator. He's also on a committee that the Danish Palestinians created to decide how they should respond to the tragic events in Gaza. "We have nothing against the Jews. There are also many of them who demonstrated against Israel's policies, but we naturally protest against the state, that commits violence and massacre against Gaza's population. And a statement like this from Olav Nielsen contributes to whipping up emotions and destroying our image in Denmark," says Monzer Dodar. "It might well be that you in the paper sharpened Olav Nielsen's statements but they paint a very dark image of us. He should have stopped the journalist and said that it's not a problem." "When children are signed up to school, nobody thinks about whether they are Jewish, Christians or Muslims," says Monzer Dodar. 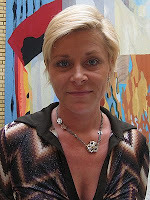 "It's our duty as citizens and humans in Denmark today to say that the image Olav Nielsen paints doesn't fit. There's no reason for people to be insecure and stressed fearing a ruckus which doesn't exist in reality," adds Monzer Dodar. He himself works with children every day and is a father to three and he doesn't doubt that children will just be children regardless of their background. "I know Olav Nielsen and respect his work, and personally I think that he blundered in this issue. But the problem for us is how the common Danes react to such statement," says Monzer Dodar, who is afraid that it will cause baseless fear for a problem which doesn't exist. "I agree with Olav Nielsen that the situation in Gaza caused violent confrontations among the Palestinians in this country, but it will no way affect a certain group in Denmark," emphasizes Monzer Dodar." "Does Hamas have anything to do with freedom, or rather, doesn't it have everything to do with Islamism of a fascist tendency? Is freedom defended by training children to commit suicide attacks and by enslaving women? Is freedom defended by Iran, which supports Hamas financially? Does freedom belong to the terrorists of Hezbollah?" "I understand that you want to wipe us off the map, just don't expect us to help you attain that goal. The fact that this old sentiment - the gist of a line uttered by a caustic Golda Meir to the Palestinian leadership - is so relevant these days, gives us a sense of the scope of the tragedy the Holy Land has been suffering through for so many decades. In fact, this same idea - the need for continued efforts to curb the intended destruction of Israel - lies behind the dramatic military decision made by the Israeli government, one that has again made it an object of wrath for so many around the world. As Prof. Joan B. Culla said recently, there can be multiple reactions to the Israel Defense Forces' military incursion in the Gaza Strip, and some of these are justifiably critical. But, given the fact that hysterical reactions abound, lacking any semblance of calm reflection, and based strictly on Manichaeanism and prejudice, there are some questions that must be asked. Ari Shavit wrote recently in Haaretz ("A Just but Tragic War," January 1) that "Operation Cast Lead is a just campaign" and that it is also a "tragic campaign." I disagree with the term "just," because, as Golda Meir also said, "We don't want wars, even when we win." A military incursion that causes dozens of deaths can never be considered just, even if it is aimed at the destruction of the Hamas military machine. But can it be considered inevitable? Some intellectuals, including Amos Oz, have already warned that the Gaza incursion will lead to a significant new wave of anti-Israel sentiment. But even the Israeli left has taken a very lukewarm position about the incursion. The decision to attack Hamas was made by an Israeli society suffering from fatigue, fed up of not being able to find a way out, or reason for hope. And fed up, too, of the knowledge that the other side is working tirelessly to destroy it. Here they are, then, the questions, directed particularly to those carrying signs proclaiming their hatred of Israel through the streets of our cities - most of them the usual suspects, from the certain ones belonging to the radical left, always ready to raise their fist against Israel, to the various sectors of Islamism. It's curious, in fact, this obscene partnership. Those who go into the streets claim to do so in favor of the freedom of Palestine. Well, where have they been all these years, as the fundamentalist phenomena that oppressed the Palestinians were on the rise? Does Hamas have anything to do with freedom, or rather, doesn't it have everything to do with Islamism of a fascist tendency? Is freedom defended by training children to commit suicide attacks and by enslaving women? Is freedom defended by Iran, which supports Hamas financially? 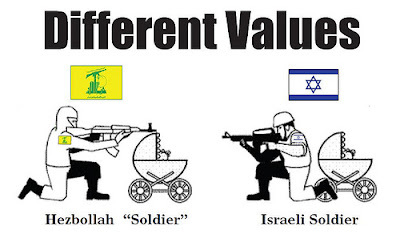 Does freedom belong to the terrorists of Hezbollah? Those who protest in the streets also say they do so out of solidarity. Well, solidarity with whom? With Mahmoud Abbas, the Palestinian president, who has been less critical of the incursion than any European carrying a sign? With the Palestinians who do not agree with having the financial aid sent to their people being used to build armies and prepare bomb attacks? Do they wonder what happens to these funds? Does solidarity with the Palestinians mean defending terrorism and excusing Hamas' aggressions? Is peace defended by boosting Palestinian leaders who do not believe in it? It is true that the intolerant left lives better by being anti-Israel. And it is also true that, in the face of complex realities, the vociferous masses prefer the simplicity of the "good" and the "bad." But, beyond prejudice, facts are stubborn. Israel withdrew from Gaza, leaving intact the economic structures it had created. Hamas destroyed them all, and took advantage of the withdrawal to prepare an army of destruction. And hundreds of missiles later, it continues its preparations. The silence of this left, which is so loud today, has been very significant. What is happening in Gaza is tragic. But it did not start with the Israeli incursion. And to put all the blame on Israel is comfortable and simple, but useless. Because the main enemy of the Palestinian people comes from within." 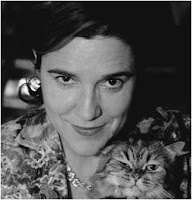 Pilar Rahola is a Spanish-Catalan journalist. She writes a regular column for the Barcelona paper La Vanguardia, where this article originally appeared in Spanish. "No one is asking how Hamas was able to bring into Gaza "under absolute blockade" some tens of thousands of rockets and missiles or the components serving to manufacture them, arms, munitions, mines, rocket propelled grenades, anti-aircraft cannons, but… no food or medicine for the population." "If you put aside the United States, the Czech Presidency of the European Union - which expressed the view on Saturday, January 3 that the Israeli operation was "defensive" and not "offensive" – as well as several politicians and media who are isolated and not in tune with the rest, Israel has been again, for the past dozen days or so, subjected to rapid fire criticisms, each more virulent than the others. "Aggression", "a disproportionate response" leading (obviously) to a humanitarian crisis, and "massacre", are the words and the ideas that come up most often in print and in the mouths of commentators. 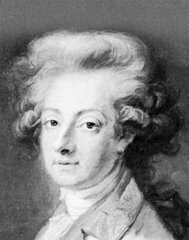 Some will even go further and categorise as "cynical" or proofs of "mental cruelty" the warnings sent out (via flyers, the radio and even by telephone) to the inhabitants of buildings targeted for bombardment and enjoining their evacuation. It is perfectly clear that no one will make the effort to note that the Israeli Army is, without doubt, the only one in the world to operate in this manner. Just as no one will dwell too long on the fact that dozens of Palestinians from Gaza - including women and children who were victims of the bombardments - are presently being cared for in the hospital of Ashkelon, in … Israel. No, it is easier to condemn Israel. Surely, it is customary, almost a Pavlovian reflex. Is Israel building a wall to defend itself against a wave of attacks that have caused hundreds of deaths since the start of this century ? It’s a crime. Is Israel practicing the "targeted elimination" of terrorists ? That’s assassination. Has Israel launched a massive offensive to force reason upon an organisation devoted to its destruction which has launched from its territory thousands of rockets and missiles since the evacuation of the Gaza Strip in 2005 ? That’s still worse ! This cheap sentimentalism would have it that Israel, a strong State, is always wrong and the Palestinians, a small and oppressed people, is right about everything. Such a position is very practical, since it avoids asking a lot of questions and having to deal with unpleasant realities. The good souls who have been marching in Europe for several days now under the flags of Hamas don't make an effort to read, for example, a document in which that organisation sets down in black and white that "Jihad [is] its path and death on God’s route is the most distinguished of their hopes" (article 8). The European diplomats who hasten to the bedside of this same terrorist organisation will certainly not read this passionate document in which the following is also stipulated: "The initiatives, the supposed peace solutions and the international conferences urged to settle the Palestinian question go against the profession of faith of the Islamic Resistance Movement" (article 13). No one is asking how Hamas was able to bring into Gaza "under absolute blockade" some tens of thousands of rockets and missiles or the components serving to manufacture them, arms, munitions, mines, rocket propelled grenades, anti-aircraft cannons, but… no food or medicine for the population. No one is asking what other State would have waited two and a half years and thousands of rockets before responding? France? Great Britain? Algeria? Russia? No one is asking what has become of the 2,000 to 3,000 Palestinian Christians of the Gaza Strip. They are not interesting, since they have been trying to flee from the terror for months now - not the terror of Israel, alas, but that of the green fascists. They even dynamited the only Christian bookstore of the city before assassinating its owner (how about that? no demonstration on that occasion…). But all these questions (and plenty more) are in vain, uninteresting and rather stupid in the end. They in fact risk leading us to think that Hamas is a totalitarian and terrorist organisation which should be fought. And that is something we would absolutely not want to consider, right ? That is not the essential point. The essential fact is that Israel is wrong. When will you finally understand that ? Sleep on, you brave folk. The world is simple and the media create your dreams for you." "A Belgian politician said Israel’s government will have to account for what is happening in Gaza, hinting that it should one day be brought before international courts. Speaking on RTL television, Elio Di Rupo, president of the French-speaking Belgian Socialist party, said Wednesday that even when you understand the Israeli desire to defend itself or to destroy Hamas, "nothing can justify the killing of civilians, women, children." "When I see these images of civilian deaths, of children, I have tears in my eyes. It is unacceptable. I cannot understand why such a suffering," he said. "The Israeli people has the right to leave in peace and security, the same for the Palestinian people," he added. He said the Israeli government took advantage of the US presidential transition and of the EU measured attitude to act. (...)"
"What the Israeli government is doing in cold blood - killing innocent people, killing women and children - is totally unacceptable and I think that what happened in some parts of the world, I mean some people were dragged before international courts, should happen to those men and women who are responsible for what is being done [in Gaza]. There is nothing that can justify killing civilians. Nothing can justify killing children, women ... people like you and me. (...) I believe that one day or another they will be brought to justice. " "I must tell you that I have more than sympathy for the Jewish population, I feel a form of love for them. But I also wish that the Palestinians live in prosperity and peace. And this cold blooded and remorseless attitude, while witnessing schools being destroyed and all those deaths, is unacceptable. It is totally unacceptable. " European Commissioner Louis Michel: "Israel is ridiculing international humanitarian law"
"Even if it is true that Hamas is a terrorist organization..." . "An EU official denounced the Israeli operation in Gaza as "unacceptable" and said "Israel is ridiculing international humanitarian law" which obliges states to protect the civilians. EU Development and Humanitarian Aid Commissioner, Louis Michel, said in an interview published Wednesday in the Belgian daily newspaper La Dernière Heure: "One must continue to put a maximal pressure to stop the operations and secure the access to humanitarian aid. The situation in Gaza is catastrophic. No more drinking water, no more electricity, hospitals in very bad shape." "I am indignant when I see that there is little notice of the side damages suffered by one and a half million people who live in a tiny strip of land," Michel added. "More than 100 civilians have been killed," he said. While expressing a positive view on French President Nicolas Sarkozy’s action in the region, Michel denounced US President George Bush’s declarations "who is doing nothing to create a climate of appeasement propitious to peace." "Even if it is true that Hamas is a terrorist organization," he added. The European Commission, the EU's executive arm, has announced an extra 3 million euros (4.2 million dollars) of emergency aid to the Gaza Strip. Last week, Michel said that "blocking access to people who are suffering and dying is also a breach of humanitarian law."" Louis Michel's son, Charles Michel, who is the Belgian Minister for Cooperation, declared at a press conference in Ramallah on 4 March 2008 that he was "shocked" by Israel's conduct : "Israel's reaction is excessive and disproportionate. It is against international humanitarian law." "To better understand the ongoing situation in the Middle-east, a brief historical overview is necessary. Since 2001 more than 7000 rockets and mortar shells deliberately targeting civilians have been fired onto Israeli cities neighboring the Gaza strip. This permanent threat to the Israeli population has tremendously changed the lives of thousands of citizens and caused the deaths of dozens while more than 1,000 were wounded. In September 2005, Israel withdrew completely from the Gaza strip and dismantled all of its settlements. In January 2006, Hamas won the Palestinian legislative elections. Rule over Gaza passed to the Islamist organization government led by Ismael Haniyeh. June 25, 2006, Gilad Shalit was abducted by the Hamas from Israeli soil – An act of aggression and provocation from Hamas to which Israel refrained from responding. In June 2007, Hamas during a bloody putsch took control of the Gaza Strip, brutally killing dozens of Fatah members while chasing out the rest. In June 2008, a 6 month truce negotiated by Egypt was expected to lead to calm, both for the inhabitants of the Negev and for the population of Gaza. This truce was not respected as many rockets and missiles were fired into Israel from Gaza. Hamas has exploited the six-month ceasefire to smuggle an enormous amounts of weapons through tunnels between Egypt and the Gaza Strip, including Iranian manufactured Grad-type rockets that have a range of up to 40 km. This kind of rocket has hit for the first time a school in Beersheba on December 31. There were no casualties since the school had been evacuated the day before. After the Israeli withdrawal, the Hamas – with total control over Gaza – could have improved the daily life of the Gaza’s citizens by concentrating its energy on the economic development of the region and ceasing its cross-border attacks. Such a step from the Islamic movement would certainly have convinced the Israeli government and the entire world community that it was capable to change. Then, it’s more likely that the Israeli authorities would have been willing to make a similar withdrawal from the West bank where most of the Palestinians reside which would subsequently lead to the constitution of a Palestinian State. Israel has tried, unsuccessfully, to send many signals to the Hamas in order it stops its attacks. Israel could more or less get along with a low amount of short range rockets, the constant increase of field of rockets finally left no choice but to intervene against the Hamas. Israel, as every Nation, has the duty to protect its citizens. It must be clear that not a single responsible Member State would sit back in silence and do nothing as its citizens and territory came under constant attack. They would not lay idle as the alarms in Sderot, Ashkelon, Beersheba and tomorrow possibly Tel-Aviv? - blare "Colour Red, Colour Red", giving Israeli civilians less than 15 seconds to protect themselves before the rocket slams into their lives, their homes, hospitals, kindergartens, schools, and playgrounds. After 6 months of truce, Hamas decided unilaterally to break it and was not only willing to cease attacks. Instead, it mocked Israel’s inability to counter attacks, explaining that the Jewish State was paralyzed by its domestic politics. Hamas thought that Israel’s will to renew the truce was an acknowledgement of weakness that allowed it to continue firing and acquiring longer range rockets. The decision to launch Operation 'Cast Lead' was not easy for the Israeli authorities but they managed to carry out an operation that could obviously no longer be postponed. Yet, Israel has declared that it does not intend to reoccupy Gaza but only to make sure that all the military capacities of Hamas will be dismantled. The aim is to make the operation as short as possible. Unfortunately, Israel cannot allow pressures to freeze its operation as long as Hamas’ aggressions have not been eradicated. Israel cannot allow a return to the previous status quo ante or, worse, a victory for Hamas. This would be a catastrophic scenario which would weaken not only Israel in the long term but would certainly put the Middle-East into an era of unprecedented chaos, strengthening the conviction of Islamist extremists – including Iran – that Israel can be defeated. As Karel Schwarzenberg, the EU presidency’s Foreign Affairs Minister stated few days ago: "Let us realize one thing: Hamas increased steeply the number of rockets fired at Israel since the ceasefire ended on Dec. 19. That is not acceptable any more". It is Israel’s interest; it is Palestinian’s interest and the world’s interest to make sure that Hamas – which is on the European terrorist organizations’ black list – will be neutralized."